Home Pressure Canner Directions: How They Work, Instructions and Tips to Using Them! Looking for Home Pressure Canner Directions: How They Work, Instructions and Tips to Using Them! in 2019? Scroll down this page and follow the links. And if you bring home some fruit or vegetables and want to can, freeze, make jam, salsa or pickles, see this page for simple, reliable, illustrated canning, freezing or preserving directions. There are plenty of other related resources, click on the resources dropdown above. If you've tried some water bath canning; making jams or applesauce, you may have been tempted to can some other vegetables from you garden. If they are low-acid (and pretty much all vegetables other than tomatoes are low acid, not counting pickles - to which vinegar, which is acidic - is added) you'll need a pressure canner! 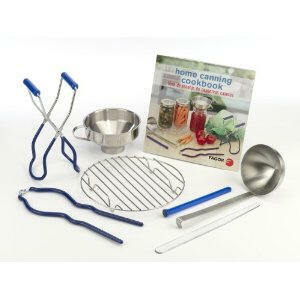 And you definitely need a pressure canner for anything containing any meat. There are limits to what you can safely can at home, though. Home canning of dairy is not recommended (USDA, Ball, etc.) , even with a pressure canner. The open water bath canners can't get water any hotter than 212 F and that's not hot enough to kill the bacteria that can grow in low acid foods. A pressure canner hits 240F which allows for home canning of many more foods, like corn, beans, meats, etc.). Why do I need to use a pressure canner to can most vegetables? A water bath canner is fine for acidic fruits and vegetables, such as jams, jellies, applesauce, apple butter, and tomatoes, but for almost all other vegetables, like carrots, squash, green beans, squash, corn, okra, etc. you'll need a pressure canner. Clostridium botulinum is the bacterium commonly found in vegetables and meats. It is harmless until it finds itself in a moist, low-acid, oxygen-free environment or a partial vacuum. In other words, a sealed jar! Under these conditions, the bacterium can grow and produce toxins dangerous to people and animals. Yes, we have ALL heard about someone's grandmother who canned without a pressure canner and lived to 90. And we all know people who smoked 2 packs a day and lived to 90. But neither is smart to do, and the odds will catch up with most people. You'll literally gambling with your life when you eat low acid foods that were canned using the open water bath, rather than pressure canning method. How does a pressure canner work? See the figure at right. Some pressure canners have an automatic vent/cover lock (pressure regulator or weight gauge). Most pressure canners have rubber or silicon gaskets or sealing rings to prevent steam from escaping between the lid and the kettle rim. Others use a tight metal-to-metal seal with the use of clamps around the edge of the lid. The dial gauge indicates the pressure; the weighted gauge regulates the pressure and indicates it by rattling). Pressure canners can usually handle either one layer of quart or smaller size jars, or deep enough for two layers of pint or smaller size jars. Unlike a water bath canner, the jars do not need to be completely covered with water. The directions that came with the pressure canner tell you how many cups of water to add in order for it to generate the right amount of pressure. You vent the pressure canner a considerable length of time while the water boils (with the jars in and the lid on). This causes steam to push out all the air. So the jars are in a space filled with only boiling water and steam. In theory, both will have the same temperature, which will be 240 F, substantially high than 212 F of an open water bath canner, due to the increased pressure. And since there is no air, just water vapor, the heat will be easily conducted to all sides of the jars. There are two types of pressure canners. The difference is in how they regulate pressure. One uses a weight that automatically lifts up and releases excess pressure above the set pressure. You can exchange different weights for different pressures. The other type, a dial pressure gauge pressure canner requires you to adjust the source of heat to maintain the desired pressure. Is one better than the other. Not really, but dial gauge canners do require periodic recalibration, so it can be argued that the weighted gauge canners are easier to maintain and to use. See this page for our recommendations and where to find them at a good price. At sea level, a weighted gauge canner operated at 10 pounds pressure per square inch provides an internal temperature of 240°F. A dial gauge canner operated at sea level, however, must be operated at 10.5 pounds pressure to reach 240°F. Generally, authorities recommend operating dial gauge canners at 11 pounds pressure at sea level because it is easier to monitor this pressure on the gauge. If you are at an altitude above seas level, you will need higher pressure to attain 240°F. At a temperature of 240°F, the time needed to destroy bacteria in low-acid canned food ranges from 20 to 160 minutes. The exact time depends on the kind of food, the way it is packed into jars, and jar size. The exact times provided in recipes for specific foods have been determined by laboratory research whch we put into each recipe in our guides (see this page for the list of guides and recipes). Ok, you're thinking, I have loads of vegetables from my garden that I could can for the winter, maybe I should get a pressure canner; but are they difficult to use? Not at all; here are typical step-by-step directions (of course, always follow any specific directions that come with any pressure canner you buy, but this will work for most!). See this page for detailed step by step directions to pressure canning! And if you are missing the manual for your pressure canner, click here for instruction manuals for all popular pressure canners. 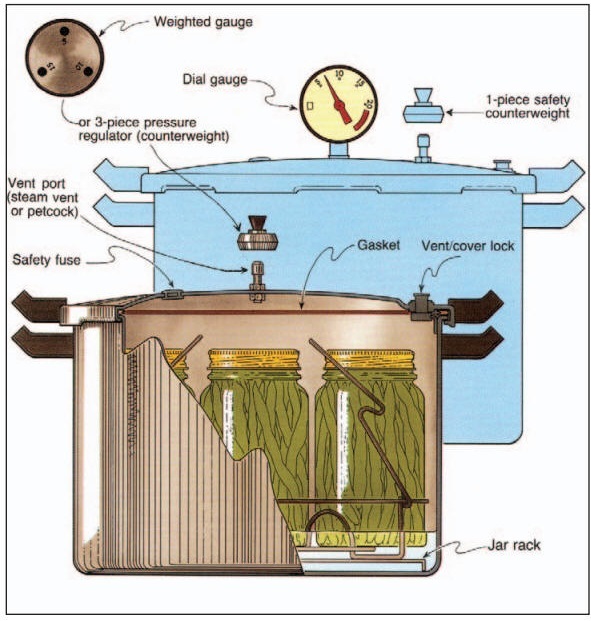 We also have a page about pressure canner annual maintenance tips and a pressure canner buyers guide and replacement parts for pressure canners. Put the canner on the stove on the largest burner. Put the rack (usually a metal plate with holes in) into the canner and 2 to 3 inches of hot water into the canner. Place the filled jars (with the lids and rings on) fitted with lids, on the jar rack in the canner. Put the canner lid and seal it down. Leave the weight off the vent port (or petcock). Turn the burner up to its highest position. Heat until the water boils and steam exits strongly from the open vent port (or petcock). While maintaining the high heat setting, let the steam flow (exhaust) continuously for 10 minutes. Allow the canner to vent for the specified time (usually 10 to 15 minutes), then put the weight or on (or or close the petcock). The canner will get up to pressure in just a few minutes. Once the pressure gauge indicates that it has reached the desired pressure (often 11 lbs) start timing! Adjust the burner to maintain a the desired pressure, as shown on the gauge. If there is now gauge, the weight should jiggle a couple of times per minute, of course, check the manufacturer's directions. At the end of the processing time (often in the range of 5 to 15 minutes; it varies for different foods altitudes and jar sizes), turn the heat off and allow the canner to cool down until the pressure is vented! Don't let the pressure drop during processing - if it starts to go down, turn the burner up just a bit. If at pressure goes below the recommended amount, increase the heat to bring the canner back to pressure. Start the timing of the process over from the beginning. If you are located over 1,000 ft above sea level; read the canner's instructions to increase the canning time or pressure. Be sure to vent the canner with steam exiting for the specified length of time to prevent air becoming trapped in the closed canner. Trapped air lowers the temperature obtained for a given pressure and results in underprocessing. Most pressure canners must be vented 10 minutes before they are sealed and pressurized. To properly vent a canner, leave the vent port (steam vent) uncovered after you fill the canner and lock the canner lid in place. Heat the canner on high until the water boils and generates steam that can be easily seen escaping through the open vent port. When a visible plume of steam continuously exits the canner, time for 10 minutes. After 10 minutes of continuous steam, you can close the vent (usually by putting the weight on it)) to begin pressurizing the canner. See below for prices, descriptions and ordering options for pressure canners. For water bath canners and other supplies, see this page! If you have a glass top radiant stove, see Canners for glass top stoves? See this page for pressure canner replacement parts, such as gaskets, rings, gauges, bolts, racks, etc. See this page about selecting a canner! If you want to can low-acid foods such as red meats, sea food, poultry, milk, and all fresh vegetables with the exception of most tomatoes, you will need a pressure canners. These foods fit into the low acid group since they have an acidity, or pH level, of 4.6 or greater. The temperature which must be reached and maintained (for a specified amount of time) to kill the bacteria is 240 F. Pressure canning is the only canning method recommended safe by the U.S.D.A. for low-acid foods such as vegetables, meats, and fish. Ordinary water bath canners can only reach 212 F and cannot to kill the types of bacteria that will grow in low acid foods. This temperature can be reached only by creating steam under pressure as achieved in quality pressure canners. If you need replacement parts, like gaskets, rings, bolts, gauges, handles, etc, see this page for Presto pressure canners. Canning all sorts of fruit and vegetables, even meat with a pressure canner it's easy. And although a pressure canner costs $100 to $200 (see this page for pressure canners models, makes and prices), they last a lifetime, and your children and grandchildren may be using it. You can also find free information from the USDA in this PDF file (it will take a while to load!) about selecting and using canners here!